Primary alcohols when heated with conc. H₂SO₄ at 170° to 180°C to produce alkenes. Secondary and tertiary-alcohol is best carried out by using dil H2SO₄. However tertiary alcohol can polimerise under influence of conc. H₂SO₄. 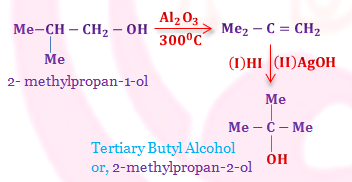 Acid catalyzed dehydration of primary alcohol gives 1-alkenes but secondary and tertiary alcohol gives a mixture of alkenes due to rearrangement of alcohol intermediate.Rearrangement however avoided by dehydration of alcohol over alumina in pyridine. Rearrangement often occurs with acid- catalyzed dehydration. All the three types of alcohol may behave in this way via a carbonium ion that may undergoes methyl or hydride ion 1,2 shift. In each case, the major product is in accordance with Saytzeff's Rule. This rule may be states in two ways: The predominant product is the most substituted alkene that is the one carrying the largest number of alkyl substituents. Or, hydrogen is eliminated preferentially from the carbon atom joined to the least number of hydrogen atoms. Most eliminations occur by polar mechanism, whereas cyclic eliminations are uni-molecular non-polar reactions which take place in one step. Most occur when the compound is subjected to pyrolysis, and proceed via a cyclic transition state.This mechanism is supported by the fact that these reactions show a negative entropy of activation. (b) Pyrolysis of Xanthates: This is known as Tschugaev Reaction. The reaction in which alkenes are formed when amine oxides are heated. As for example, propene from propyl bromide. Zinc dust and methanol also dehaloginate 1,2-dihalogen derivative of alkanes, as for example propene from propene dibromide . Boord have prepared alkenes by conversion of an aldehyde into its chloro-eather, treating this with bromine followed by a Grignard reagent and finally treating the product with zinc and n-butanol. This method is very useful for preparing alkenes of definite structure, and an interesting point about it is the replacement of the ∝-chlorine atom by bromine when the ∝-chloro eather undergoes bromination in the β-position. Wittig reaction affords an important and useful method for the synthesis of alkenes by the treatment of aldehyde or ketones with alkylidenetriphynylphosphorane (Ph₃P=CR₂) or simply known as phosphorane. The witting reagent, alkylidenetriphenylphosphorane, is prepared by treating triarylphosphine usually the latter with an alkyl halide in eather solution. The resulting phosphonium salt is treated with strong base (such as C₆H₅Li, BuLi, NaNH₂, NaH, C₂H₅ONa etc.) 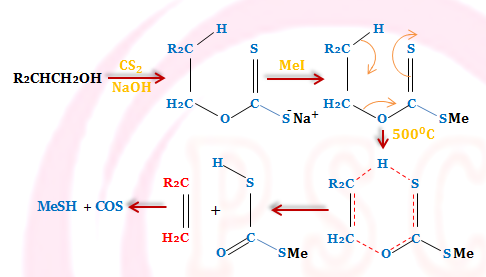 which removes a halacid to give the reagent, methylenetriphenyl phosphorane. The reaction probably proceeds by the nucleophilic attack of the yield on the carbonyl carbon. The dipolar complex (betain) so formed decomposes to olefine and triphenylphosphine oxide via a four-centered transition state.